More pictures and the review on my blog. Eeep! I love the pockets! what a fun skirt! 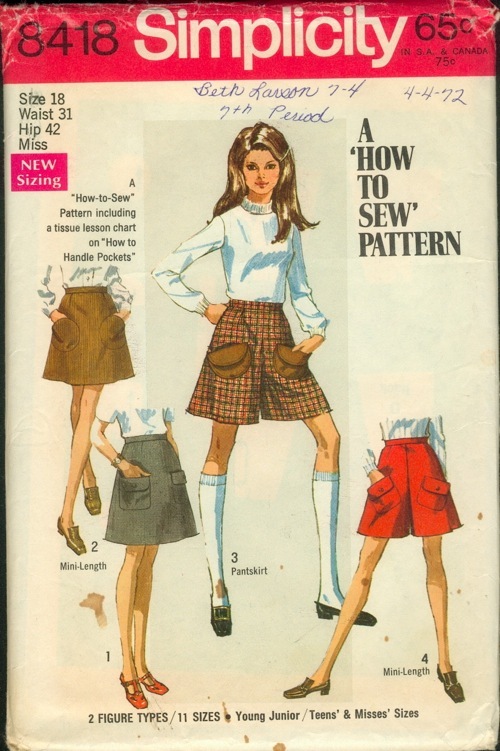 I especially like the fabric that you used on the pockets. Wow, yours is MUCH cuter than the pattern envelope – how often does that happen? I really love the contrast stitching/piping/whatever that is! Oh, and I’m old enough to remember that style of top – I really loved them. Cute and comfortable. Hmmm, wonder if I’m too old for one now? Holy Smokes! How have I never run across your site before. So fun! The pockets on this skirt—AWESOME!!! I am SO in love with this! The pockets are amazing – and the decorative topstitching is gorgeous! Those are just the types of patterns I pass up for being too bland, or no redeeming features, you’ve proven me entirely wrong with this project, add imagination into the mix and what a gorgeous end project you get!